"What is A Good Tuba Mouthpiece Style & Size for a Student?" There are two different styles of tuba mouthpiece. Students tend to find that they play better on one style or the other. The Bach 7 is a mouthpiece style that has a bowl shaped cup and is wider around the rim. The Conn Helleburg is the style that has a funnel shaped cup and is narrower around the rim. Both are fine mouthpieces for a tuba; one just fits some students better than the other. It is a good idea to try both and see which style is the best choice for you. The Bach 18 and Yamaha 67C4 are popular sizes, but on the smaller side. They are fine sizes, but students usually do as well or better on a Bach 7 or Conn Helleburg. They will often continue on that size as they get older unless they move to something larger. 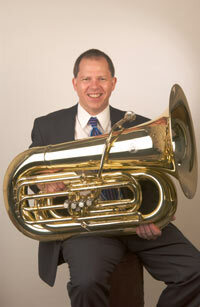 You would think the tuba would be easier to play with a smaller mouthpiece, but typically it is not. However, if a student sounds great on something else, let them play it. These are not "student" mouthpieces, they are good sizes for students. Many professional players use these same mouthpieces. Remember: Whatever mouthpiece you choose, it is always the results, not the size, that matters most!